Based on StatsCan numbers, in 2015/2016, International Students to Canada pay on average $21,932 a year in tuition fees, compared to $6,191 a year paid by their domestic colleagues. I have heard in some circles, the talk of a “1 international student pays for 4 domestic students” a ratio that appears to be close to met based on these recent figures. In order for an international student to even be determined to be financially sufficient for a study permit they must be able to cover the cost of first year tuition, the cost of housing, personal expenses, and transportation to and from Canada. They must also show that they have some potential plan in place to pay the remainder of the amount. Accompanying spouses/dependents add additional monetary requirements to this calculation. Furthermore, different visa posts also carry different requirements ranging from being able to show the finances in a bank draft, a letter of financial support, and even prepaying tuition. As shown by the ATIP results below from a (then Citizenship and Immigration Canada, now Immigration, Refugee and Citizenship Canada or “IRCC”), and likely still in effect – amounts proposed to be earned through work by the applicant or accompanied spouse is not to be taken into account in the calculation. 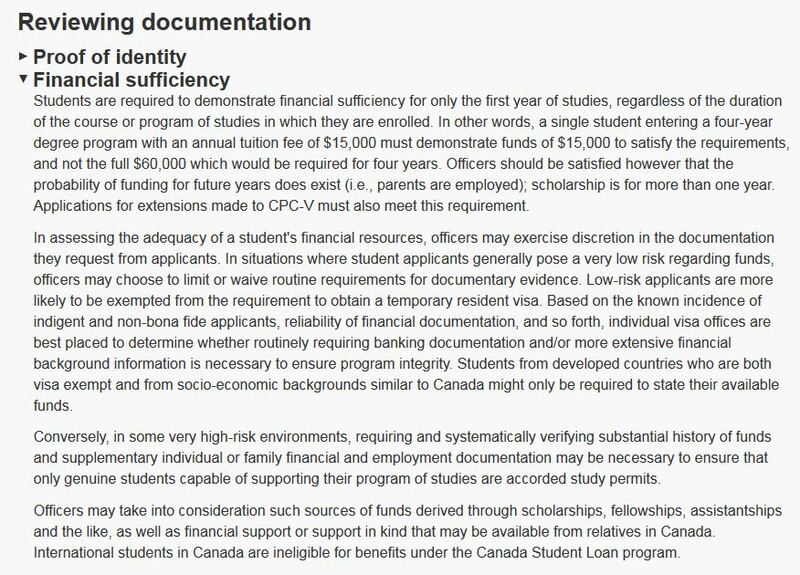 If we look at just the baseline number as provided by IRCC”s program delivery guides on study permit financial sufficiency we find a very troubling fact. In order to have sufficient financial resources, the international student student must be able to pay the cost of first year tuition (let’s put it at the average of $21k). Student base: $10,000 for twelve-month period, prorated at $833 per month, plus cost of tuition. Spouse/common-law partner/ first family member base-$4,000 for twelve-month period prorated at $333 per month. Dependent child/subsequent family member base-$3,000 for twelve-month period per dependent child of any age, prorated at $255 per month. This does not, from my understand, include rent – which itself in several cities can add up to about $20,000 to 24,000 a year. Total, a single student would be expected to have $51k (21 + 10 + 20) in currently available, liquid funds in order to study in Canada for one year. Whether these requirements are actually strictly enforced at overseas visa offices is a question that must be looked into further. Yet, I question whether requiring $51k from an international student (currently close to the annualized living wage amount ($20.68/hr) for a family of four from Vancouver) is setting an unrealistically high barrier to Canadian education. Is it also in so doing creating unintended policy consequences? With that amount required, it is both not a surprise that those who can afford to study in cities such as Vancouver must be supported by their parents, who themselves must by extension be financially well-off. While such a link has not yet been drawn, I would argue that international students factor prominently into the discussion of foreign ownership in the city of Vancouver, a link that has been overlooked due to the often complex arrangement in which houses are bought and rented, and statistics gathered and tracked. Spots in these institutions are filled by those who can pay and those who can arrange (third-party, unlicensed agencies) rather than by merit. Often times these students either fail their courses or end up being removed/leaving Canada, their pathway to any future marred by their poor grades and lack of a concrete study plan. All this to say, I think if we make entry into Canada’s international student population more merit-based, more based on a required comprehensive study plan, we can encourage candidates that will be better permanent residents and whom Canada can invest in to gain long-term benefits. Another barrier right now, is that students are encouraged in their study permit applications to prove they are a “temporary resident” and will “leave at the end of their authorized stay.” Perhaps our model should be switched to requiring students to demonstrate lower finances, but a higher desire to come to Canada for more than just a short-term purpose. Perhaps, we should ask international students to declare up-front whether they intend to stay for a short-term and return to studies in their home country, or if not, plan an educational strategy to become a permanent resident. I think the Labour Market Impact Assessment “Transition Plan” provides a model that I would like to see implemented for international students. We can do this with corresponding policies that make it easier for international students to eventually become permanent residents, as this government has promised. 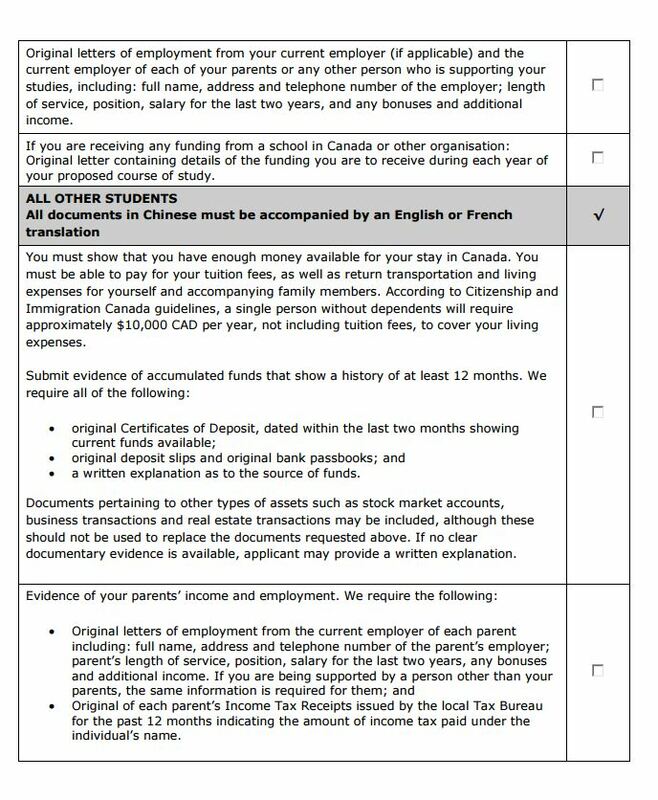 I can even forsee a student who has followed through their Educational Transition Plan being awarded extra-points when they are applying for Express Entry down the road. A lot of options, but one barrier remains requiring the student to be wealthy. I never had those finances growing up, and in fact, to generalize, those of my colleagues who were most successful in university came from quite middle-class households, where the family income for a family of four was around 50k. While times of changed, I think if we are more flexible with funding arrangements, we can attract more working class individuals and families who through Canadian education can transition become our future Canadian citizens. Several clients and individuals have been contacting me relating to the issue of financial sufficiency. Studying in Canada is expensive (sometimes prohibitively so), and for several students demonstrating sufficient funds to support studies in Canada will be an issue. What I want to tackle in this piece is the amount that is included in the IMM5843/IMM5710 (and ideally explained later) in a Study Permit Application. How is adequate financial sufficiency calculated? Officers must make sure that applicants have sufficient financial resources to pay their tuition fees, transportation costs to and from Canada, as well as living expenses for themselves and any family member who may be accompanying them, without the need to engage in employment. (c) pay the costs of transporting themself and the family members referred to in paragraph (b) to and from Canada. The big kicker, is the part that states without the need to engage in employment. I know that I have seen several study permit applications where counsel/applicants would emphasize that the applicant will be working part-time or possibly that their spouse would find a job and earn X amount of dollars. This line appears to take those factors outside of the Officer’s scope of analysis. CIC’s guidelines don’t always seem so crystal clear – particularly when they go beyond their legislative scope into things such as employment as a source of proof. I think Applicants with refusals due to lack of financial resources may want to review the Officer’s analysis and, if they are reapplying, find ways to satisfy the Officer’s Training Module criteria while ensuring to cite the proper legislative framework. I think also that CIC needs to bring about a little more parity in the way it assesses and provides public information about issues such as financial sufficiency in light of the clear legislative language. Utilizing the same language across all sources – document checklists, visa specific posts, and training manuals would certainly ensure greater consistency. 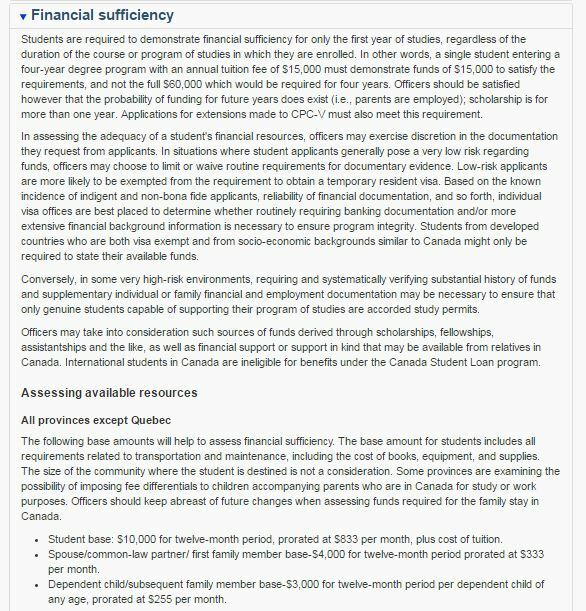 Please note that the screenshot above titled “Assessment of Funds and Tuition” is derived from an Officer Training Module obtained via Access to Information and Privacy from Citizenship and Immigration Canada. I am not in any way affiliated with Citizenship and Immigration Canada (CIC) nor am providing this information on their behalf or a representative of their organization. I also cannot confirm whether these are and will be the current Training Manual instructions moving forward.